Growth of Singapore´s machinery and engineering sector is driven by demand for semiconductor and industrial process control equipment as well as refrigeration/cooling systems. Further expansion in 2018 and 2019 will be sustained by robust industrial production growth (8% and 4% respectively). However, business performance and profit margins of machinery traders could be negatively affected by the ongoing trade dispute between China and the US. The gearing of machinery businesses is rather low, as most machinery manufacturers in Singapore are parts of global groups, supported by intercompany loans. Banks are not restrictive in lending to the industry. Payments in the machinery sector take between 90 days and 100 days on average. Payment experience has been rather good over the past two years, and the insolvency level is low compared to other sectors. No increase in payment delays or insolvencies is expeced in the coming 12 months. Our underwriting stance remains generally open to neutral for the industry. We are mainly open for machinery businesses delivering to manufacturing sectors, as this segment benefits from persistent growth in semiconductor and electronic manufacturing activities. The same accounts for food-related machinery, which benefits from persistently growing demand. That said, we take a neutral approach to construction-related machinery businesses, as the Singaporean government has taken measures to cool down the property market in order to avoid price hikes. 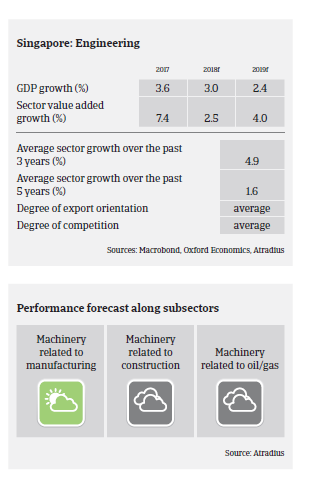 This will slow down growth in the construction sector and demand for related machinery equipment.